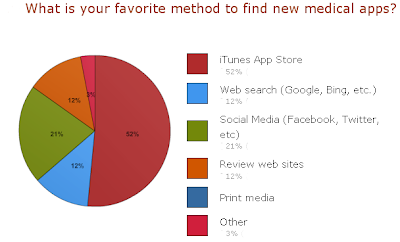 iPhone Medical Apps: Medical App Survey - Where do medical professionals find apps? Medical App Survey - Where do medical professionals find apps? Our survey of 100 medical professionals located in the USA shows that the favorite method for finding apps is the iTunes App store (52%). Social media, a very hot internet marketing area, follows in a distant second at 21%. These results suggest that medical app developers should focus considerable effort in preparing the listing for a new app in the iTunes App Store. More results are to be published later!